The new position statement released last fall by the American Diabetes Association (ADA) updated nutrition recommendations that will change the way dietitians counsel clients and patients with diabetes. The overarching message of the new guidelines is that there’s no single eating pattern that’s best for everyone with diabetes; the key to achieving optimal health and nutrition is individualization. Variations of the word “individualized” are mentioned more than 20 times in the statement compared with just four times in the 2008 position statement, driving home the point that RDs should develop meal plans based solely on each patient’s needs. 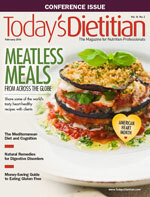 This article will discuss the highlights of the new ADA position statement, “Nutrition Therapy Recommendations for the Management of Adults With Diabetes”; how it differs from the previous position statement published in 2008; and how the updated individualized recommendations may impact the way dietitians counsel clients and patients moving forward. The revised position statement attests to the fact that, as research evolves, nutrition advice changes. For the latest update, and the first one made by the ADA regarding these guidelines, the association conducted a systematic review of all available diabetes nutrition research using a strict grading system. Based on the review of the scientific evidence, the ADA confirmed, and therefore restated several times in its position statement, that there’s not a one-size-fits-all eating pattern for individuals with diabetes. Instead, it calls for all adults diagnosed with diabetes to eat a variety of minimally processed, nutrient-dense foods in appropriate portion sizes as part of an eating plan that takes into account individual preferences, cultures, religious beliefs, traditions, and metabolic goals. However, the concept of individualization isn’t completely foreign to the ADA. A previous literature review the organization conducted in 2001, which was published in the February 2002 issue of Diabetes Care, supported the idea that there isn’t one ideal macronutrient distribution for all people with diabetes. But while the ADA has just confirmed that individualized nutrition therapy is best for diabetes patients, some dietitians already had considered it standard practice. “This has been a basic component of good counseling skills,” says Marie Fasano Ruggles, RD, CN, CDE, diabetes education program manager at Mercy Medical Center in Rockville Centre, New York. Ruggles shows patients with diabetes how to continue eating traditional foods by tweaking the ingredients and rethinking the ingredient proportions and methods of preparation. “People love when you show respect for their cultural heritage by working out ways for them to keep favorite dishes in the plan,” she says. The 2008 guidelines recommended a minimum carbohydrate intake of 130 g/day, which was based on providing enough glucose to fuel the central nervous system without relying on glucose production from ingested protein or fat. The new guidelines don’t have this recommendation. “The recommendation of a minimum of 130 g of carbohydrate per day originally came from the 2006 Institute of Medicine [IOM] recommendation, which doesn’t have anything to do with blood glucose control and should be thought of as more of a guideline than a precise minimum amount. Therefore, the ADA committee felt that the recommendation [of 130 g carbohydrate per day] was no longer appropriate to include in the nutrition position statement,” Urbanski says. The new recommendations place emphasis on where the carbohydrates come from and suggest that whatever carbohydrates are eaten should come from vegetables, whole grains, fruits, legumes, and dairy products over other sources that contain added fats, sugar, or sodium. In addition, fiber recommendations no longer hold as much weight, in part because existing research showing improved glycemic control with fiber is unrealistic and requires fiber intakes of more than 50 g/day. The new recommendations state that people with diabetes should consume at least the amount of fiber and whole grains recommended for the general public. The recommendations regarding the substitution of sucrose for starch remains essentially the same. The writers did emphasize that consumption should be minimized to avoid displacing nutrient-dense food choices. People with diabetes should follow the same guidelines for saturated fat, trans fat, and cholesterol as the general public. Saturated fat should be less than 10% of calories, cholesterol fewer than 300 mg/day, and trans fat limited as much as possible. Previous recommendations for fat limited saturated fat to 7% of calories and cholesterol to fewer than 200 mg/day, and stated that trans fat intake should be minimized. The new recommendations suggest that people with type 2 diabetes may benefit from following a Mediterranean-style, monounsaturated fatty acid–rich eating pattern. The ADA’s position on vitamin supplementation remains essentially the same: There’s no clear evidence of benefit from vitamin or mineral supplementation in individuals without underlying deficiencies. However, since the previous position statement, there has been more conflicting research on the benefits of vitamin supplementation. The writers of the new guidelines also believed there was a lack of compelling evidence to support the use of cinnamon and other herbal products to improve glycemic control in people with diabetes. They stressed that herbal products aren’t standardized; they vary in the amount of active ingredients they contain and may have the potential to interact with other medications. In recent years, recommendations for specific dietary sodium targets have been the topic of much debate. The 2010 Dietary Guidelines recommend that people aged 14 to 50 limit their sodium intake to 2,300 mg/day. People aged 51 or older, blacks, and people with hypertension, diabetes, or chronic kidney disease—groups that together make up more than 50% of the US population—are advised to follow an even stricter limit of 1,500 mg/day. In 2012, the World Health Organization recommended fewer than 2,000 mg of sodium daily for all adults; its previous recommendations were set at 2,000 mg. Then, in a May 2013 press release, the IOM stated that evidence doesn’t support a sodium intake recommendation of fewer than 2,300 mg.
Also parting ways with the 2010 Dietary Guidelines that recommend all people with diabetes reduce their sodium intake to 1,500 mg/day, the ADA’s new position statement recommends people with diabetes follow the same guidelines (fewer than 2,300 mg/day) as the general population. For individuals with diabetes and hypertension, the guidelines suggest further reduction in sodium intake be individualized. The writers also suggest consideration be given to palatability, availability, and additional cost of specialty low-sodium products and the difficulty in achieving both low-sodium recommendations and a nutritionally adequate diet. “There’s some evidence that individuals may have difficulty meeting all other nutrient requirements when following a 1,500-mg sodium restriction,” Urbanski says. There are many roads that lead to achieving a healthful diet, and no one meal plan or eating pattern works for all people with diabetes. To counsel clients effectively, nutrition professionals must remain open-minded, individualizing medical nutrition therapy based on their patients’ health goals, personal and cultural preferences, and health literacy and numeracy. In addition, patients must have access to healthful food choices and be ready, willing, and able to change. Nutrition intervention should emphasize healthful eating patterns and provide individuals with practical tools for following a day-to-day food plan and achieving behavior change that can be maintained over the long term.